Malcolm Smith was a good friend and colleague of mine - we shared a similar upbringing within the ranks of the Salvation Army. He became a principal player in some top London orchestras such as the BBC Concert Orchestra, London Symphony Orchestra, and the Orchestra of the Royal Opera House, Covent Garden. He was also a talented arranger and this recording features an exotic arrangement he made, originally for himself with the BBC Concert Orchestra, here featuring the National Philharmonic Orchestra. Probably one of the finest EBE recordings we made, it included some of the legendary names in brass playing - Maurice Murphy, Rod Franks, Malcom Smith, Richard Martin, Mark Bennett, Geoff Bryant, James Gourlay, Patrick Harrild, Robert Childs and Gary Kettel on percussion. Recorded in the wonderful acoustic of St Jude's, Hampstead Garden Suburb, London, it was sight-read and recorded in the last 45 minutes of an incredible session of brass playing. Definitely a career highlight! 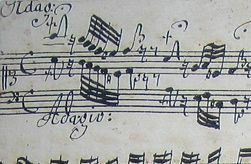 The 'Rondo alla Turca' is the third and final movement from his Sonata No. 11 K331 originally composed for piano. At the time the music of Turkish Janissary bands was very much in fashion. These groups are thought to be the oldest form of military marching bands in the world so it seems appropriate that this music should be arranged for brass. The recording is featured on the album "A Night in Vienna"
The Sonata by Jean Hubeau is one of many superb French pieces for trumpet and piano published by Alphonse Leduc. The Spirtual is the final movement and is written in a lazy, blues-influenced style - lyrical and evocative with a triumphal and challenging ending with regards to stamina and range - it is a must for all aspiring trumpeters and popular with any audience. This recording was made in St Peter's Church, Petersham, Surrey in 2006. John Iveson's arrangements for Philip Jones were a key element in the success of the ensemble. Immaculately prepared and skilfully worked, his work represents some of the finest examples of brass orchestration. He was also the leading trombonist of his generation and Jealousy is a a wonderful example of his work. Written as a showcase for the ensemble. 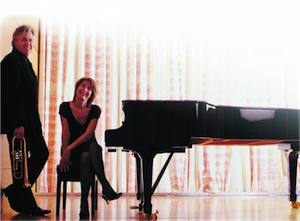 John offers a distinctive take on Jacob Gade's classic tango originally composed in 1925. Bach's Toccata and Fugue in D minor needs no introduction. It is one of the most distinctive and dramatic works ever to have been composed and is recognisable immediately for it's dramatic and powerful open stanzas. 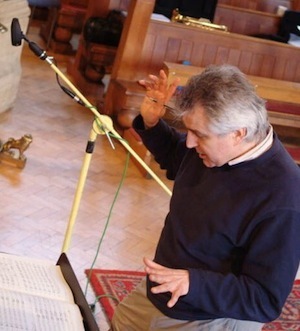 This recording was made for the ASV album, 'Toccata'.